There are so many recipes that you can try out for the holiday and for those who love to cook, this is going to be really fun. Hundreds of new recipes are waiting, and you simply want to try everything out. That’s why, we searched and searched until we found our ten favorite recipes for this Easter and we would like you to check them out. There is something from anything – from appetizers to desserts. Some are really easy and require few minutes, while others want your attention more than that. Check them out and find your favorite! Prepare something delicious and most important of all – share it with your family and friends! 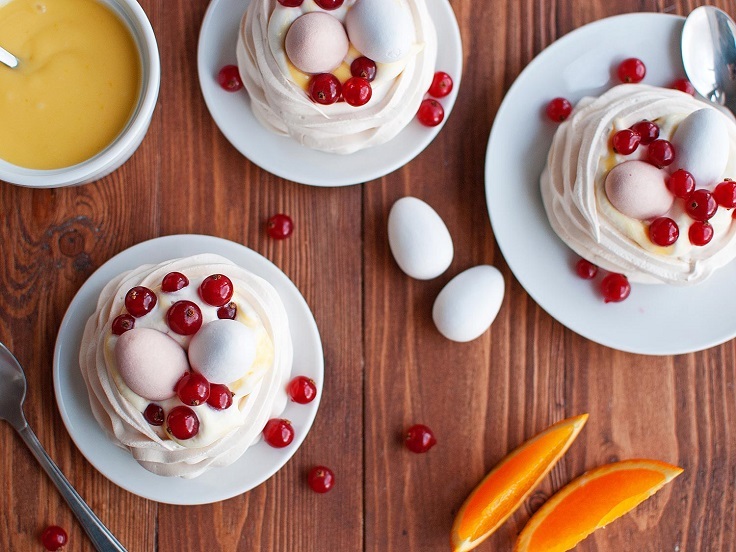 The meringue nests with orange curd are the perfect dessert for everyone, especially for those who aren’t too much into sugar. The meringue is easy to prepare, for this one you need about 180 gr of sugar, 3 egg whites and 1/4 teaspoon vanilla extract. For the orange curd, you need 6 tablespoons heavy whipping cream, 2 tablespoons orange zest and 1/2 cup orange juice from 2 oranges, 1/2 cup sugar, 6 egg yolks and 6 1/2 tablespoons cold unsalted butter. To make it even better, serve it with heavy whipping cream, fresh berries and candy – covered chocolate eggs. Puff pastry, cheese and asparagus are a great combination, which if you haven’t tried by now, we definitely recommend it. 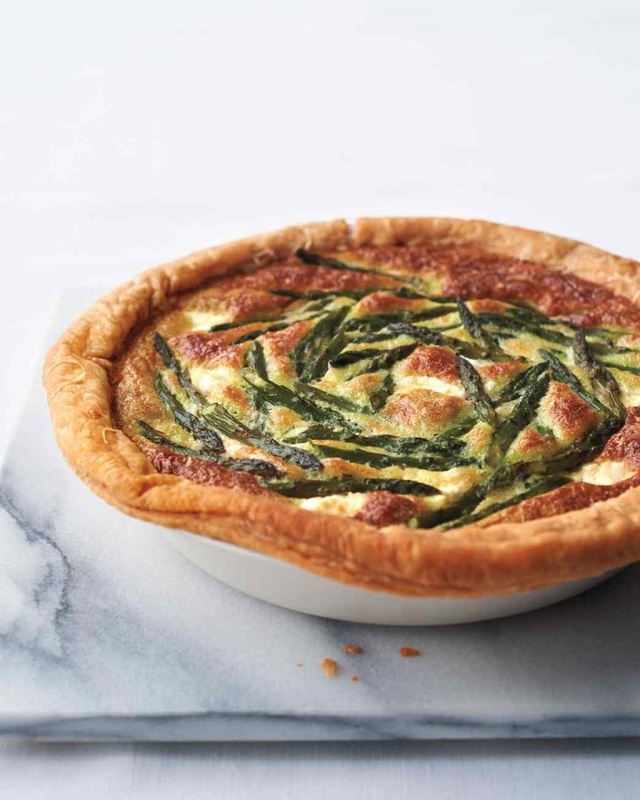 Make sure you have 1 pound asparagus, 1 sheet frozen puff pastry, 1 tablespoon all purpose flour, 2 teaspoons extra – virgin oil, 4 large eggs, 1 cup heavy cream, 1 1/2 ounces Gruyere cheese and 2 ounces fresh goat cheese. This can be the perfect Easter starter meal, everyone would like to eat a piece of this savory tart! Keeping things simple and healthy is also a great option. There are so many salad recipes, that is simply so hard to choose only one. The one we picked is antioxidant and detox salad, with mixed flavors such as fruit and cheese together. 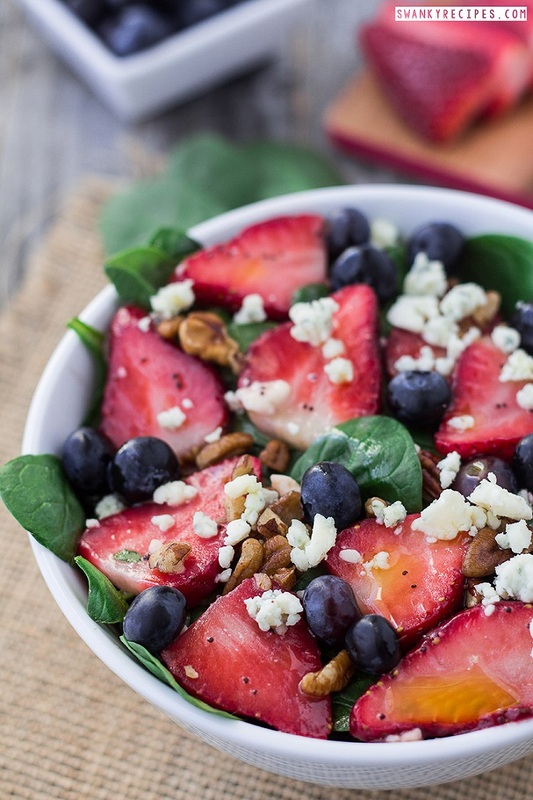 What you need is baby spinach, strawberries, blueberries, pecans and Gorgonzola cheese, while for the dressing you can use lemon juice, olive oil, poppy seeds, cider vinegar and so on. How much to use of each ingredient it depends on how much you want the salad to be big. We definitely recommend this salad because it’s really healthy and delicious, and can be a great side dish. What makes this dish really special is that it is made of four layers – aubergine, tagine, hummus and chickpea layer. They all are prepare with delicious ingredients, including spices such as cumin, coriander and cinnamon. 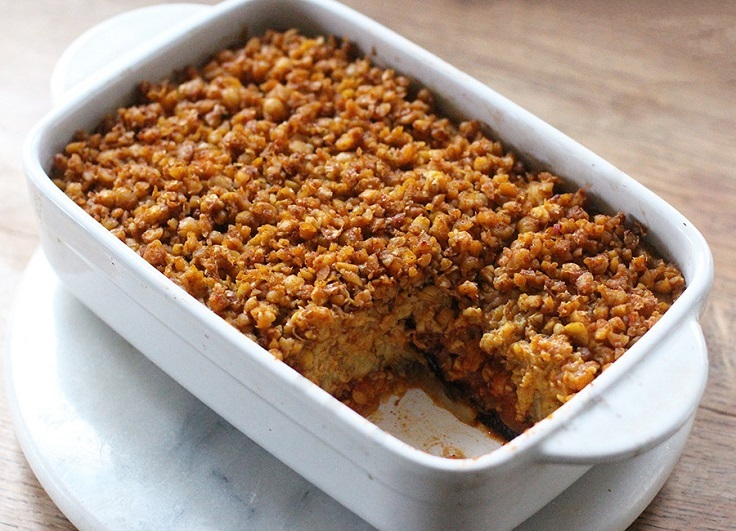 It will take you about one hour to prepare the Moroccan Chickpea Bake and it serves 4. 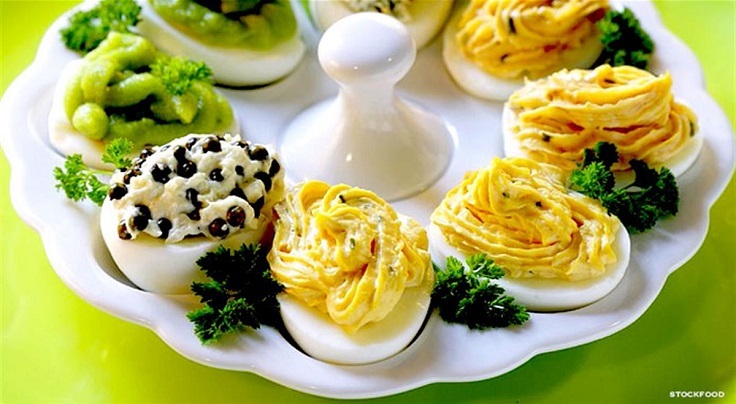 It’s a perfect food idea for Easter, especially if you’re celebrating it with close ones. If you want to combine the dish with something as well, having it with salad or steamed vegetables is a great idea. This is the ultimate Easter inspired dessert, and we love it! It looks super delicious and we’re sure it is – it’s tiramisu we’re talking about. 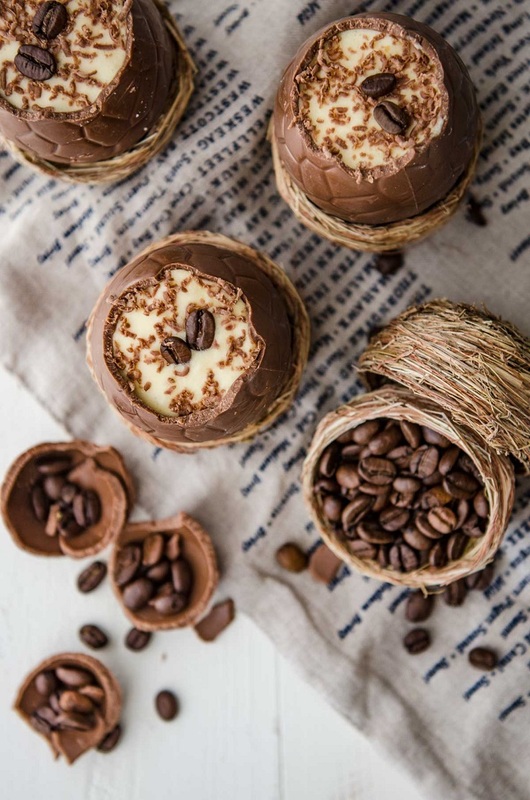 You need 4 hollow chocolate eggs, 2 eggs, 2 tablespoons caster sugar, 125 g. Mascarpone cheese, 3 – 4 savoiardi biscuits and 1/4 cup espresso coffee. Prepare the tiramisu and place it inside the chocolate eggs, but before that remove the tops of the chocolate eggs. Grate the remaining chocolate over the tiramisu and you can also top with coffee beans. Before serving, cover and refrigerate the tiramisu eggs at least two hours. 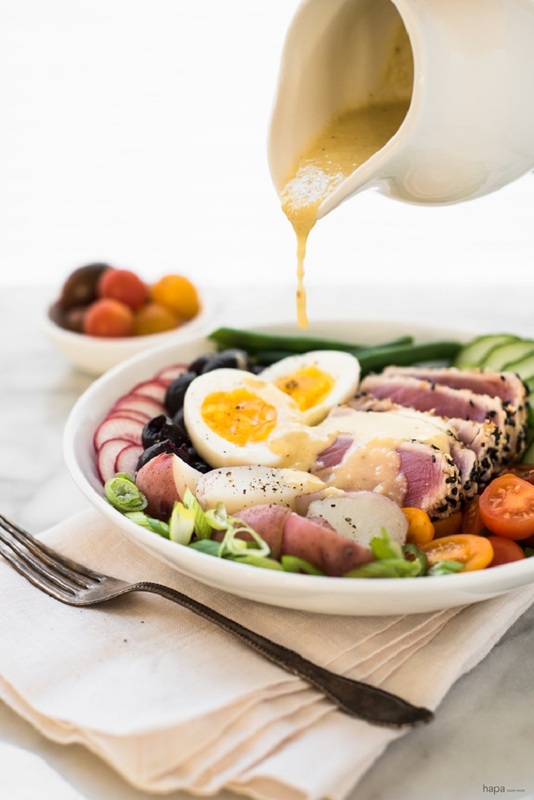 This is a combination of the famous Nicoice salad and Ahi tuna. To prepare the tuna, you need 3/4 pound sashimi quality tuna, 2 tablespoons olive oil, 3 tablespoons white sesame seeds, 2 tablespoons black sesame seeds, kosher salt and freshly ground black pepper. The salad is rich and it will make you feel full even without the tuna. It has eggs, mini red potatoes, green beans, arugula, English cucumber, scallions, grape tomatoes, radishes and olives. Put as much as you need. Having more salad is always welcome. Moist cake bars have proven to be a successful dessert, no matter the occasion. 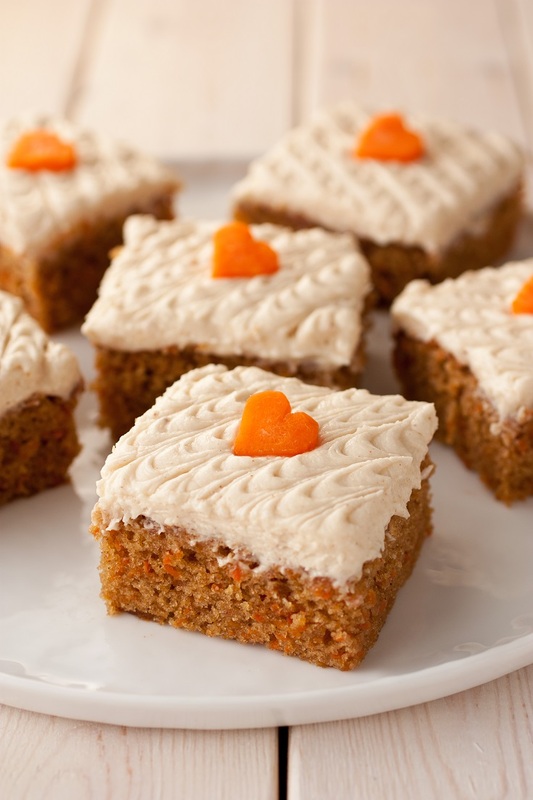 Easter has its own spirit, so here is something for this holiday – carrot cake bars. They have simple, but yet delicious taste and even more delicious brown butter cream cheese frosting. The cake bars contain cinnamon and ground ginger, which give away such a warm, cozy aroma and they make the bars taste like Autumn. You can top with more cinnamon or other spice, or you can also try nuts – walnuts would be perfect. This sweet bread will surely bring all the attention to the table. It is such well decorated that is simply hard to miss it, and even harder not to taste it. You need 1 cup whole milk, 1/2 cup sugar, 2 large eggs, 1 tablespoon instant yeast, 1 cup grated lemon zest, 2 teaspoons anise seeds, 1 1/2 teaspoons salt, 5 cups unbleached all-purpose flour, 6 tablespoons unsalted butter and 6 colored eggs. 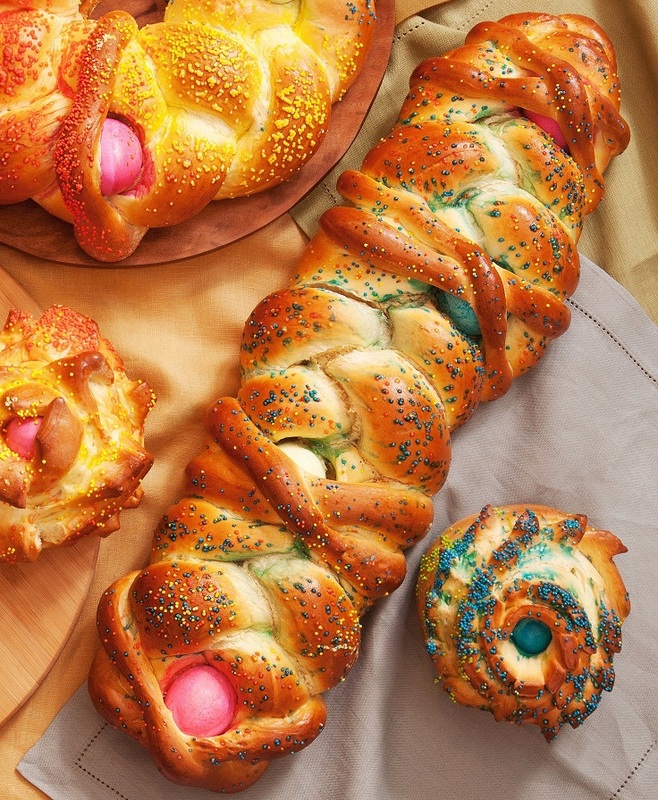 These were the ingredients for the dough, while for the glaze you need 1 large egg yolk beaten with 1 teaspoon whole milk and for garnish use colored sugar decorations. 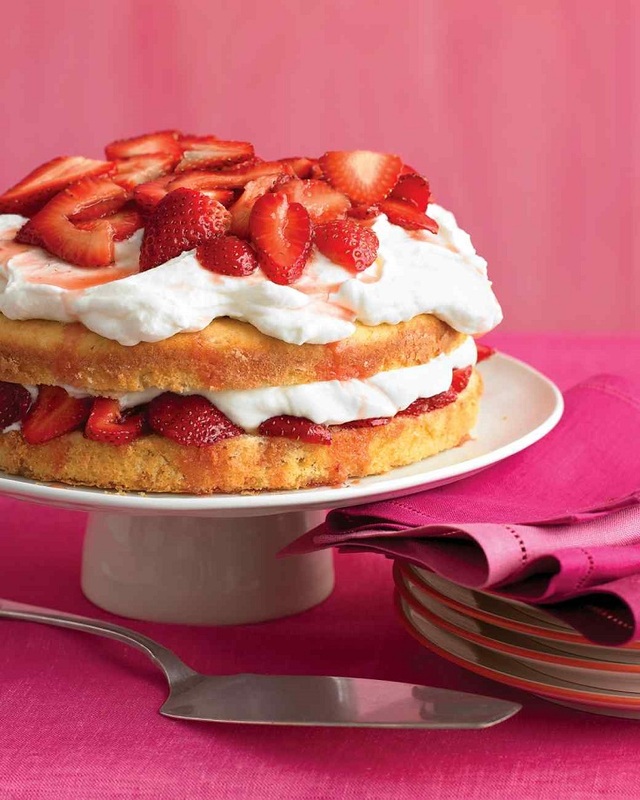 Buttery cake with fresh strawberries and whipped cream is an amazing way to end the Easter’s dinner or lunch. It’s easy to prepare, and even easier to eat a whole piece of it! To prepare the cake, you need 1/2 cup unsalted butter, 1 1/2 all – purpose flour, 2 teaspoons baking powder, 1/2 teaspoon salt, 1/2 cup sugar, 2 large eggs and 2 more large egg yolks, 1/2 teaspoon vanilla extract and 1/2 cup whole milk. For the filling, you need 1 pound strawberries, 1/2 cup sugar, 1 teaspoon unflavoured gelatin and 1 1/2 cups heavy cream. This is the easiest recipe on the list. All you need is few eggs and different toppings. Avocado, cream cheese, paprika, capers, lemon juice, chive, tabasco and mayonnaise are just few of the ingredients that you can use. This recipe is a great appetizer, and it will serve you well in case you’re short on time or running out of ideas. It will take you less than 30 minutes to prepare it, yet it will be a decadent appetizer for Easter. its very delicious and looking wonderful .